Guánica ([ˈɡwanika]) is a town and municipality in southern Puerto Rico, bordering the Caribbean Sea, south of Sabana Grande, east of Lajas, and west of Yauco. It is part of the Yauco Metropolitan Statistical Area. 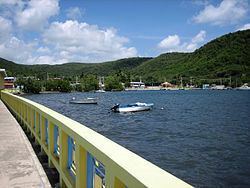 The town of Guánica, also known as Pueblo de Guánica, is the principal town of the municipality. The town's population in 2000 was 9,247 people among 3,808 housing units over a land area of 2.49 square miles (6.45 km2). The town is located on a deeply indented harbor of the same name. The harbor resembles a tropical fjord, narrow and bordered by rugged hills, barely a quarter-mile wide, but about two miles (3 km) from mouth to the town. The town is about 100 miles (160 km) and over two hours driving distance from San Juan, the capital city of the island, and about 20 miles (30 km) west of Ponce, another principal city of the island. Guánica's postal zip code is 00653 and telephone area codes are 787 and 939. The urban area of Ensenada has a separate postal zip code of 00647. Juan Ponce de Leon landed in the Guánica harbor on August 12, 1508 and founded a town called Guaynía, a word derived from the Taíno indigenous culture that possibly meant "Here is a place with water". The town, considered the capital of the island of Puerto Rico (which was at that time named Isla de San Juan Bautista), was destroyed during the indigenous uprising of 1511, and the area was abandoned by Europeans for some years, during which time San Juan (itself at first called Puerto Rico) became the capital of the island. The refounded town of Guánica was at first a part of the municipality of Yauco until Guánica was established as a separate municipality on March 13, 1914. Víctor Ángel Sallaberry Safini was Guánica's first mayor. On July 25, 1898, American forces (who included the young poet-writer Carl Sandburg led by General Nelson A. Miles) landed in Guánica as part of the course of the Puerto Rican Campaign in the Spanish–American War. This invasion led to Puerto Rico being acquired by the United States. The invasion, just one small part of the war between Spain and United States, occurred in Guánica due to its sheltered harbor and proximity to Ponce, besides being such an unexpected site for such an attack, which had been anticipated at the heavily fortified city of San Juan. 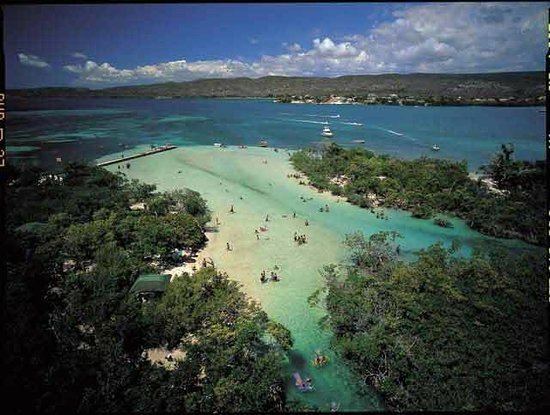 The Gloucester was the first ship to set anchor in the Bay of Guanica. Twenty-eight sailors and Marines, under the command of Lieutenants H. P. Huse and Wood, departed from the ship on rafts and landed on the beach. The Marines lowered the Spanish flag from the beach flagpole and replaced it with the American flag. They then proceeded to set up a machine gun nest and placed barbed wire around their perimeter. The first land skirmish in Puerto Rico between the Puerto Rican militia and the American forces occurred when Lt. Méndez López and his men attacked and opened fire on the Americans. During the small battle which followed, the Americans returned fire with their machine gun and the Gloucester began to bombard the Spanish position. Lt. Méndez López and three of his men were wounded and the militia unit was forced to retreat to the town of Yauco. The invasion is commemorated by a contentious monument on the waterfront: along a broad paseo (el malecón), there is a large coral boulder marked by the carved words, "3rd Battalion, 1st U.S.V. Engineers, September 16, 1898." July 25 was subsequently commemorated in Puerto Rico as Occupation Day, later renamed Constitution Day (see Public holidays in Puerto Rico). Guánica is a modern town that maintains roots and connections to a traditional past. Known as el pueblo de la amistad (The town of Friendship), it is also occasionally referred to as el pueblo de las doce calles (the town of the twelve streets). The central part of town consists of five streets running north-south crossing seven other streets that run east-west, resulting in a compact grid of 24 square blocks, one of which is the town plaza. Facing the plaza is the Catholic Church, city hall, a school, and many shops; the plaza itself contains greenery, walks, and a music stand. In recent years this central area of the twelve streets has been extensively supplemented by suburbs in the south and west. Hills surround the town and harbor, including the 450-foot (140 m) hill to the east of town, itself topped by the tiny Fort Caprón. Two large factories, one producing fertilizer, partially distract the eye from the pleasant landscape, but both have been important to the economy of the town, at one time dominated by the sugar plantations of Central Guanica. The resort chain known as Club Med once attempted to set up a luxury resort on beaches east of the town, but withdrew due to local opposition which was apprehensive about both environmental and community degradation. East of the town some 200 acres (0.8 km2) of land, including three miles (5 km) of beach, have been intermittently for sale. It is a fishing village; commercial fishermen still ply their traditional trade beyond the harbor entrance. Guánica State Forest (Bosque Estatal de Guánica) is also the name of a small dry forest reserve east and west of the town, the largest remaining tract of tropical dry coastal forest in the world, and designated an international Biosphere Reserve in 1981. The park comprising much of the dry forest is known as el bosque seco de Guánica. Highway Route 116, the nearest principal road, heads west toward Lajas and east toward Ponce, passing through the island of Puerto Rico's driest area. The largely intact forest of the Guánica Dry Forest reserve hosts the greatest number of bird species found on the island, including several bird species seldom found anywhere else: the Puerto Rican lizard cuckoo, Puerto Rican woodpecker, the Puerto Rican nightjar, and the Puerto Rican emerald hummingbird. Other animals thought to be extinct in Puerto Rico have turned up in this forest. Many different types of cactus grow here, a stunning contrast to the lush Caribbean National Forest in the northeast part of the island, which is a tropical rain forest. The contrast is due to the mountain ridge Cordillera Central which separates Guánica from the northeast part of the island; while the northeast receives over 100 inches (2,500 mm) of precipitation each year, Guánica receives less than 30, and some regions of the forest reserve are said to receive only six inches. The forest reserve of some 9,500 acres (38 km2) contains 36 miles (58 km) of trails through four different forest types: deciduous trees, a coastal region with tree-size milkweed and nine-foot-tall prickly pear cactus, a mahogany forest, and twisted gumbo limbo trees. There are about 700 varieties of plants, including aroma (acacia) and guayacan (lignum vitae - Latin for wood of life). One guayacan is about 500–700 years old. The squat melon cactus and other cacti can be found here along with 40 species of birds, including the guabairo (Puerto Rican nightjar), found nowhere else. Also in the area are a crested toad (Peltophryne lemur) and, sometimes on the beaches, green and leatherback turtles, though their eggs suffer severe predation from mongooses one time introduced to fight rats in sugar cane fields. The forest office can be reached at 787-821-5706. The view of the bay and town from the stone tower at the top of Cerro Caprón make it worth the hike up the 450-foot (140 m) hill. Thirty-six miles of trails and ten miles (16 km) of undeveloped coastline, with peculiar limestone caves along the western side of the harbor make it a special place. Highway route 325 leads west to Point Jorobado and good snorkeling. Route 333 leads east by a small but beautifully situated park at the base of a cliff, and past the Guánica Lighthouse, now in disrepair with restoration plans ahead. Route 333 follows the coast, bordered with mangroves, to Balneario Caña Gorda, by the Copamarina Beach Resort. There are several good seafood restaurants in town and at the end of this road; the end of the road is also a favorite bird watching area. Nearby are several mountain biking trails, fantastic beaches, and the Ballena Bay refuge for turtles, birds, and other wildlife. This refuge narrowly escaped Club Med's development plans. Its peculiar though precarious natural state makes the region a place of great beauty and scientific importance. Uniformed mix of "Indio Taino, Africano y Espanol". No race segregation reported. 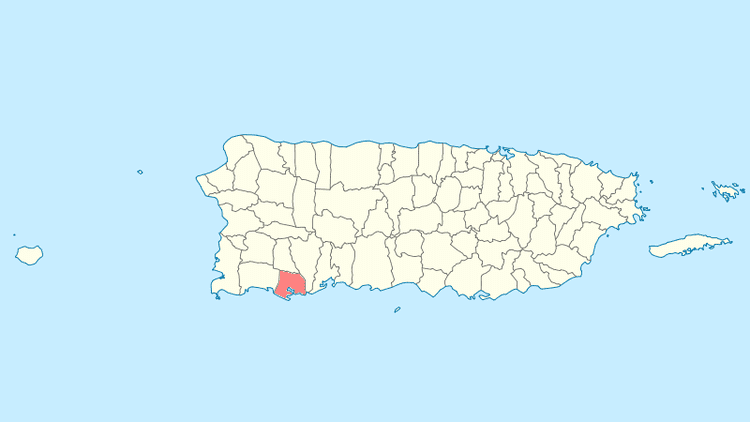 Like all municipalities in Puerto Rico, Guánica is administered by a mayor. The current mayor is Santos Seda, from the New Progressive Party (PNP). Seda was elected at the 2012 general election. The city belongs to the Puerto Rico Senatorial district V, which is represented by two Senators. In 2012, Ramón Ruiz and Martín Vargas Morales, from the Popular Democratic Party, were elected as District Senators. The five waves, blue and yellow represent the Guánica Bay, a fragment of the Official Shield of Guánica. Shield divided in four quarters. In the superior right side, it has a "bohio" (hut) under a crown that represents Cacique Agüeybaná, whose yucayeque (Indian territory) was in this region. In the superior left quarter, a lion representing Juan Ponce de León. The checkered strips over a silver-plated background in the inferior right side represent the shields of Don Cristóbal de Sotomayor, founder of the town of Tavara, the actual location of Guánica. The waved stripes represent the bay of this town. The branches surrounding the shield represent the sugar cane industry that was very important in this region.